This page was kind of thrown together so it could use some improvement. If you have ideas or contributions to make, let me know. 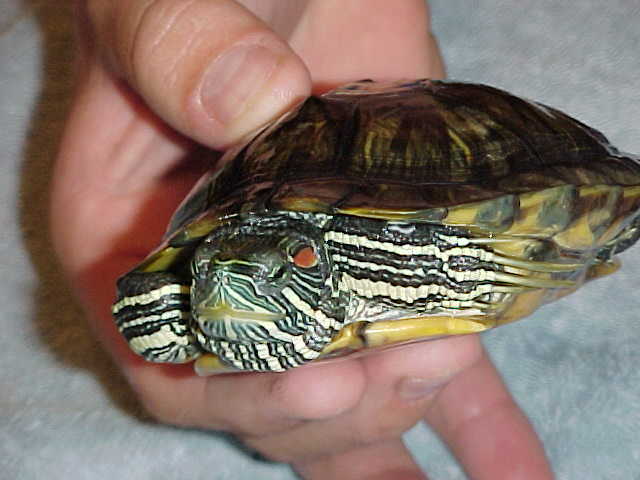 The most commonly encountered slider is the red-eared slider ( Chrysemys scripta elegans ). 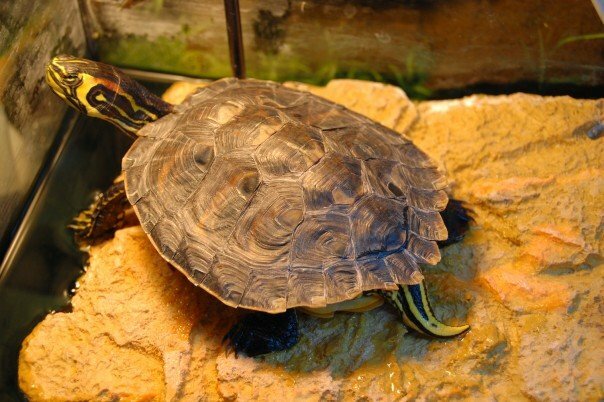 In fact, it is the most common turtle sold as a pet. 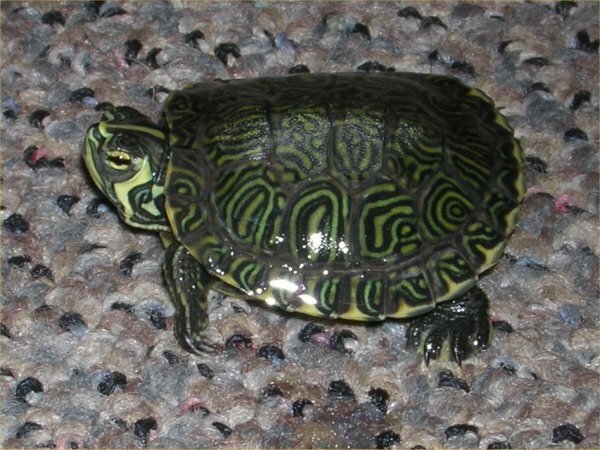 In the 50's, it was the dime- store turtle. 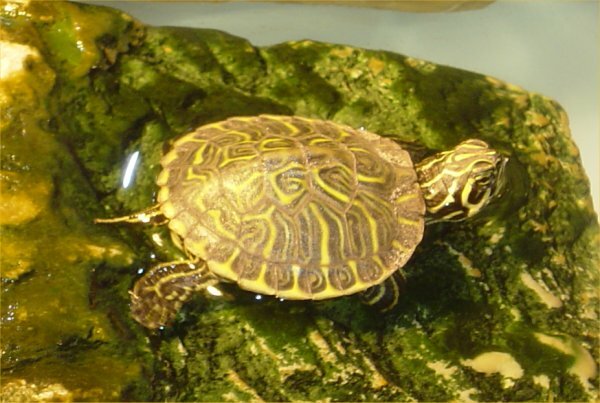 In additions to red-eared sliders, there are yellow-eared and yellow-bellied sliders ( Chrysemys scripta scripta ). All need similar care. They can probably all interbreed. 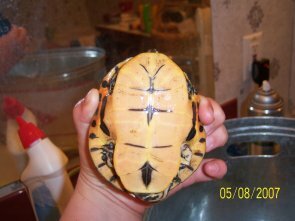 Sliders belong to the genus Trachemys and used to be sold at dime stores all over the place before the salmonella scare. 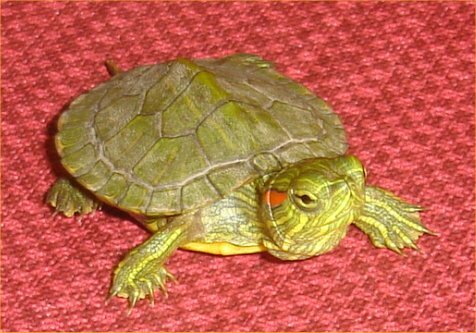 Red-Eared Sliders ( Chrysemys scripta elegans or previously Pseudemys scripta ) (RES for short) are one of the easiest species of water turtle to acquire. 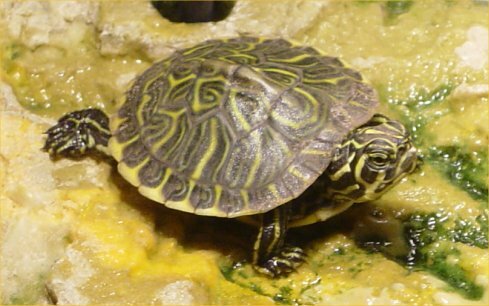 Red-eared sliders have a red or yellow patch behind each eye and grow to about 5 to 11 inches with some individuals growing even larger. Available color variants include albino and pastel. Sliders can survive winters in Zones 7 or higher in the USA. 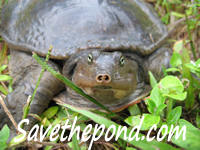 In Zones 6 and 7, survival may be kind of iffy and depends on the exact pond situation (depth, heating, etc.). Further South, they can live outside year round. You could also bring them in during the winter. They prefer water from the mid 70's to the high 80's (degrees F). There are many other species of sliders which mostly live in warmer climates. Sliders are omnivorous so they can damage your plants and animals. Larger sliders are more herbivorous than youngsters. Males have longer tails and nails and are generally smaller. 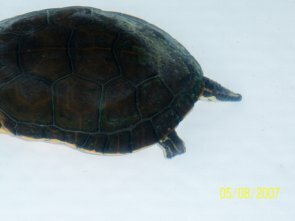 While males mature after a few years, females cannot breed until they are 5 to 7 years old. 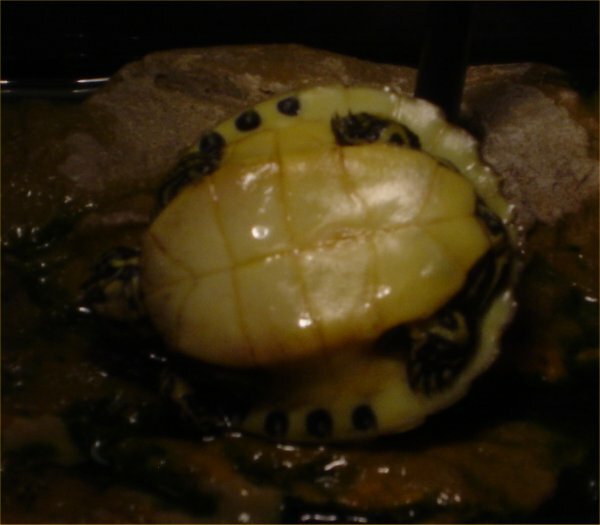 Females lay up to three clutches of 3 to 20 eggs per year in the summer. Eggs hatch in 2 to 2.5 months but may overwinter in the nest. 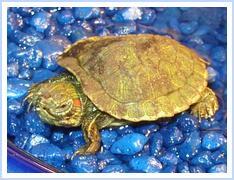 Visit this slider site to learn about how to breed red-eared sliders. 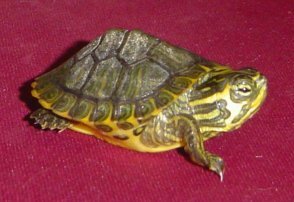 Note: I really do not know how to tell the following turtles apart as babies or adults: yellow- bellied sliders, chicken turtles, and the cooters that are yellow. Some of my identifications may be wrong. What is the secret? Red-eared slider in the turtle pond at the Washington, D.C. zoo on 10/2/11. On 10/16/08, we went to Meadowlark Botanical Gardens. 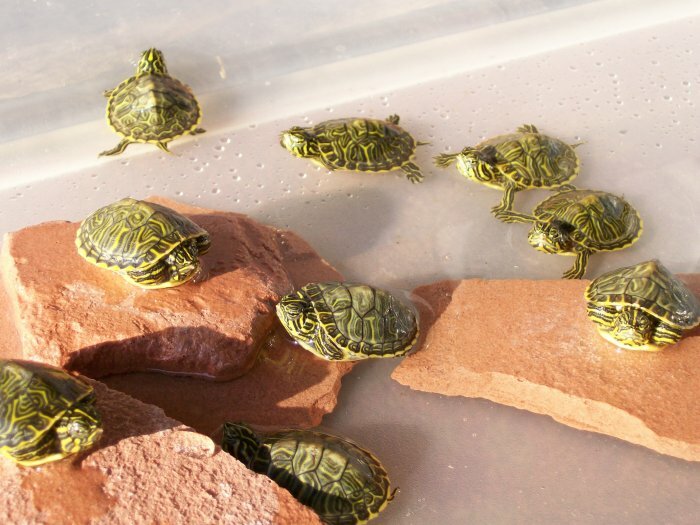 In one of their large ponds, there were a lot of turtles. 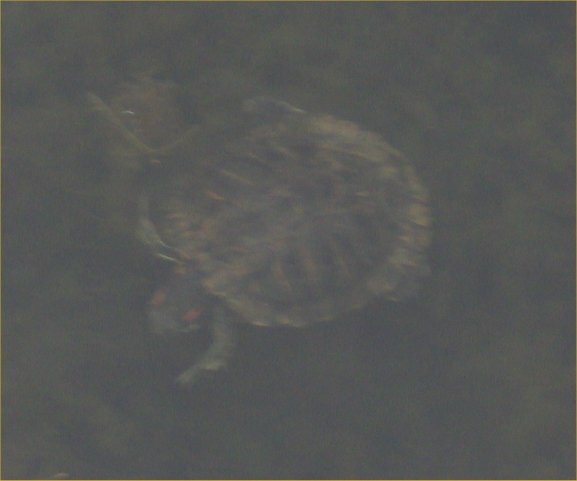 Once I processed the photos, I could only identify one of the smaller ones as a red-eared slider. To see other photos from the gardens including the other turtles, go to this page. 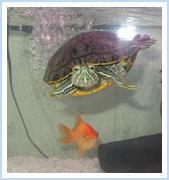 On 10/1/07, Christina sent these photos of her two baby red-eared sliders. 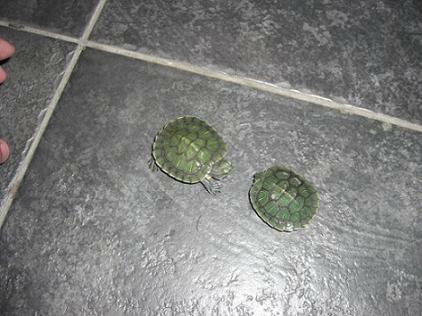 Two baby red-eared sliders - view from above. 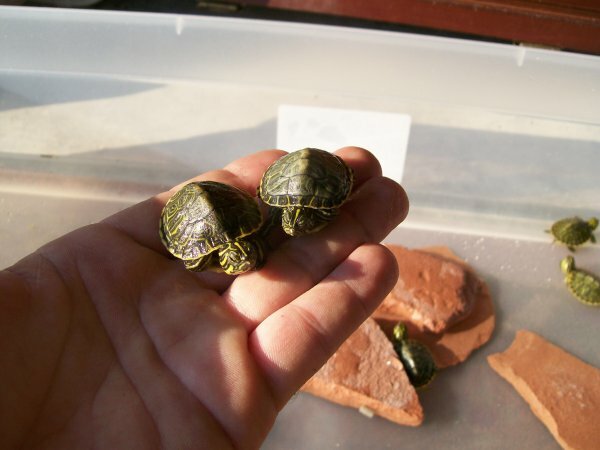 One baby red-eared sliders - view from above. 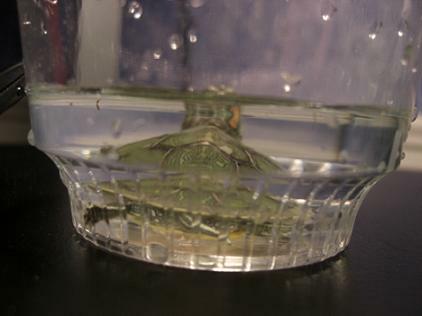 One baby red-eared slider - view from behind, in a glass bowl. 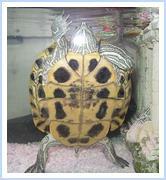 Kathy sent these photos for identification on 9/15/07. 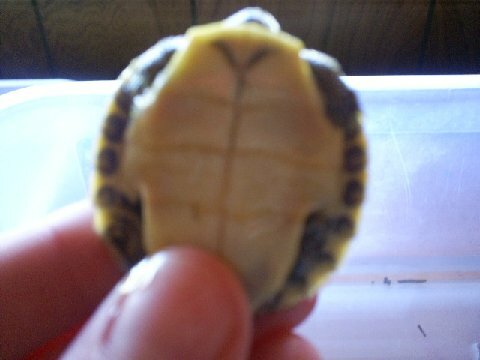 I think this young turtle is a yellow-bellied slider. 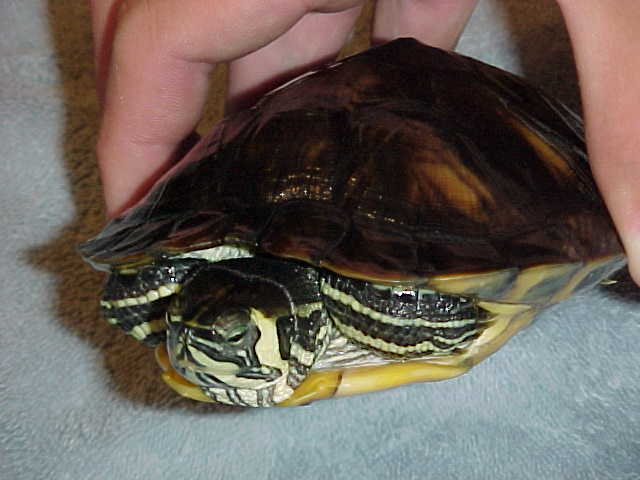 A person without a name sent three photos of their two red-eared sliders to me on 8/26/07. They sent the photos because the sliders are turning white. A gave them a list of ideas for what might be wrong (too much light/basking, chlorine in the water, no fluorescent light?) but did not hear back. 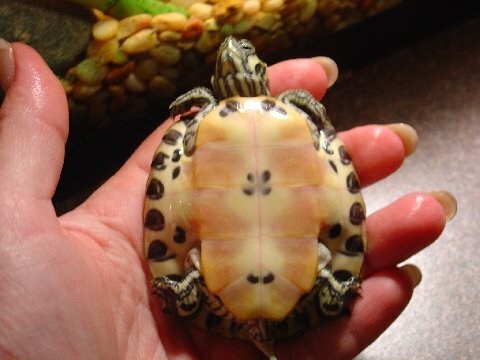 Does anyone else know why turtles might bleach out? 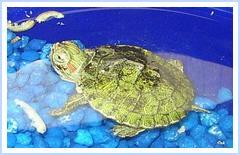 Kayla sent me these photos on 8/12/07 of a turtle that she rescued from the jaws of a dog. 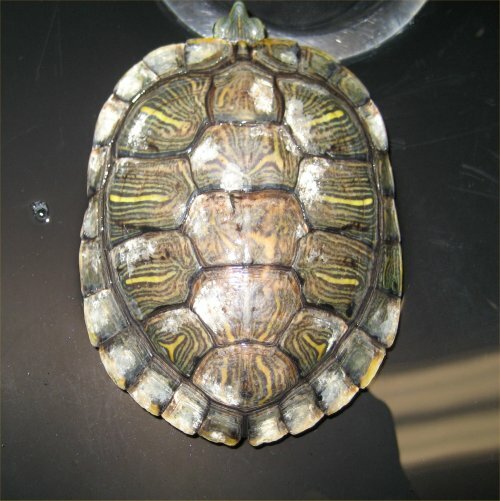 This female yellow-bellied slider lost part of her left back leg. She named the turtle Stumpy. The photos are small so I put them all up. 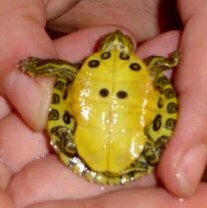 Kayla said the turtle was a painted turtle, and at first, I did not notice that Stumpy was not a painted turtle (due to bad photos and my befuddled brain) but someone pointed out that Stumpy is a yellow bellied slider (most likely). 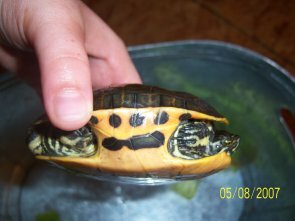 On 7/31/07, Sena sent these photos of her red-eared and yellow-bellied sliders. 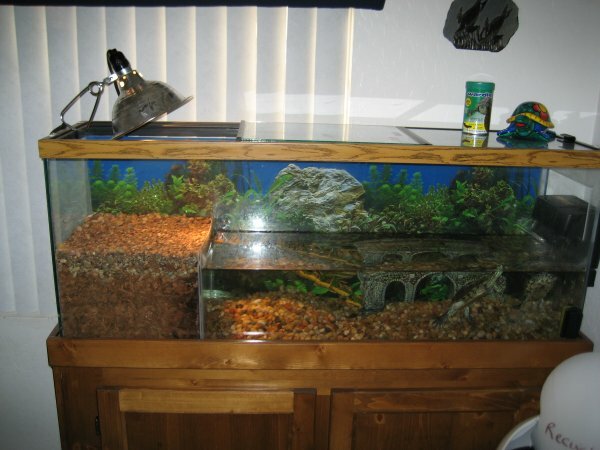 She had seven turtles in a 55 gallon tank so they were very crowded. 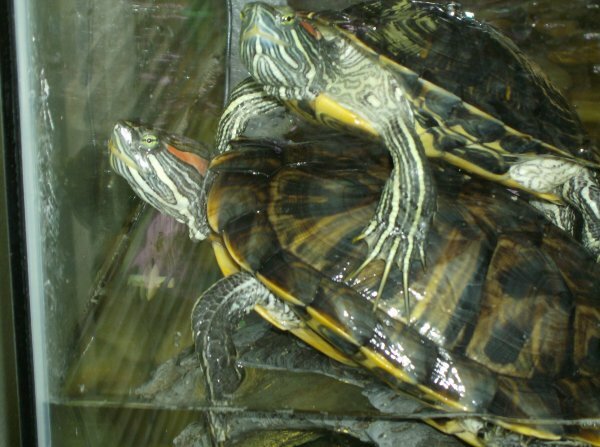 Two red-eared sliders - the one on top is male. The bottom one might be female. Three red-eared sliders and two-yellow bellied turtles. 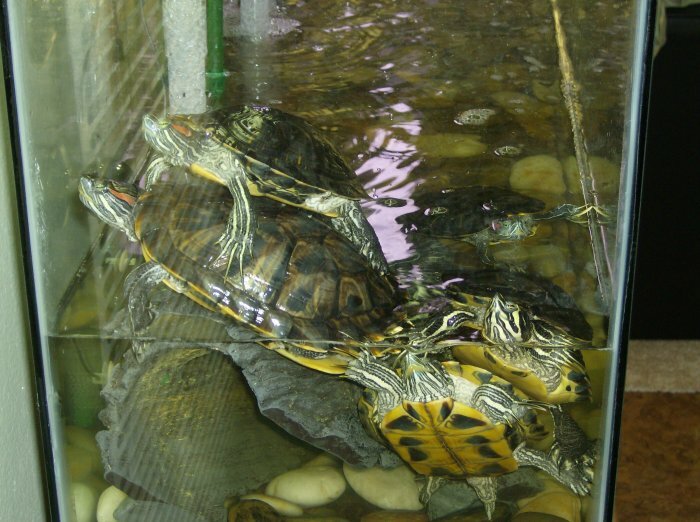 It looks like they are all male based on the nail length except maybe the one red- eared slider on the bottom left. 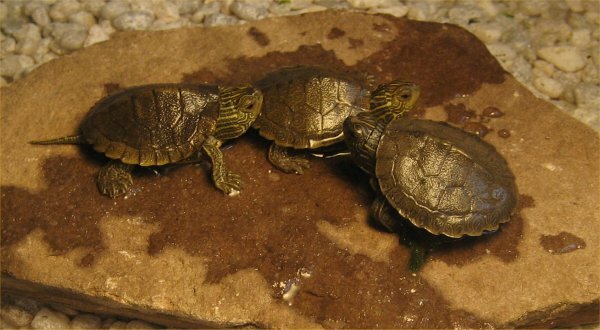 The yellow-bellied sliders are the two on the bottom right. 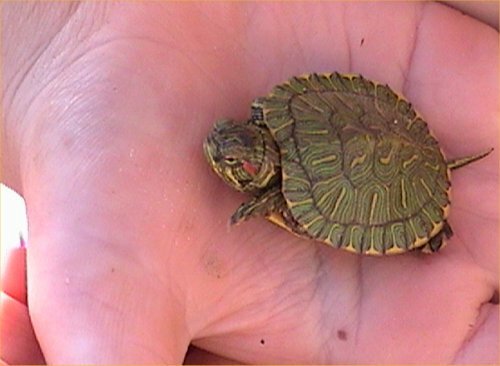 Derek sent these photos on 7/26/07 of a baby turtle that he found. 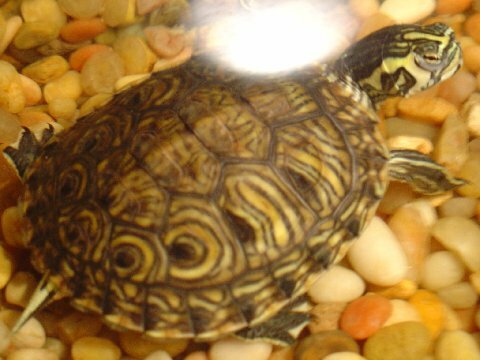 We think it is a yellow-bellied slider. These are good photos. 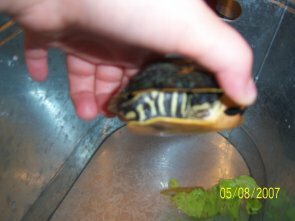 Matthew sent these photos on 5/31/07 of his yellow-bellied slider named Patrick when he was baby and then at 1.5 years old. Patrick as a baby - top front view. Patrick at 1.5 years old - top front view. 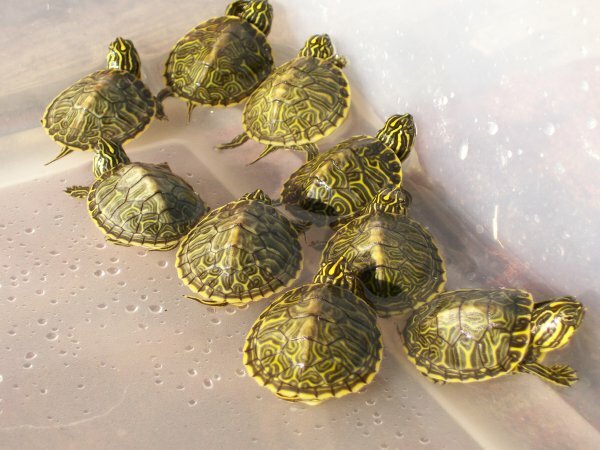 Frank sent this photo of hatchling turtles on 5/27/07 that he found at a waste treatment plant. 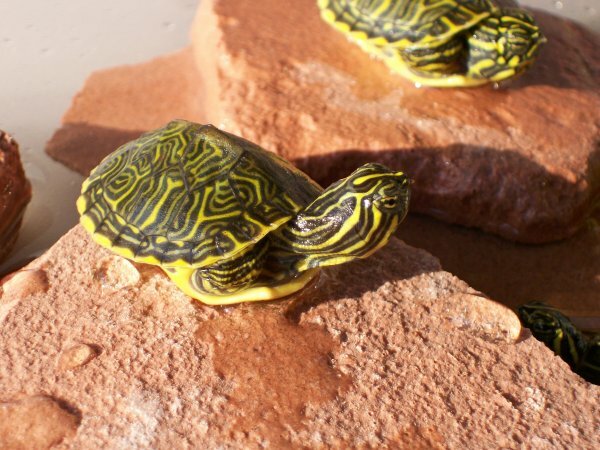 I am not sure if they are yellow-bellied sliders or perhaps some sort of cooter. What do you think? 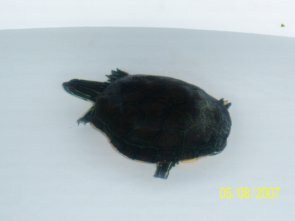 Andrea sent these photos of a baby turtle for identification on 5/31/07. It looks a lot like Patrick in the previous photos. 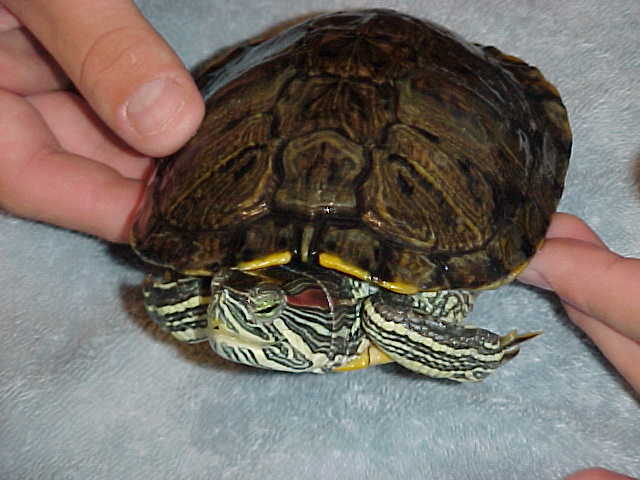 I think it may be a yellow-bellied slider as well. If not, then some sort of cooter. What do you think? 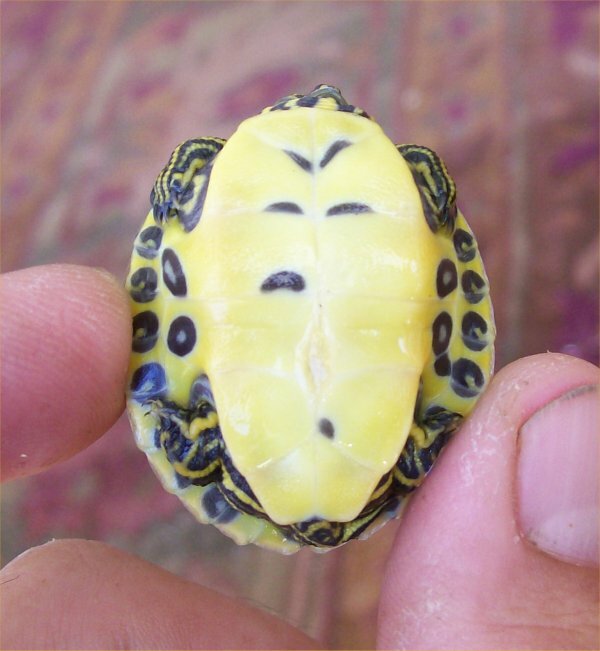 Baby turtle - top view. 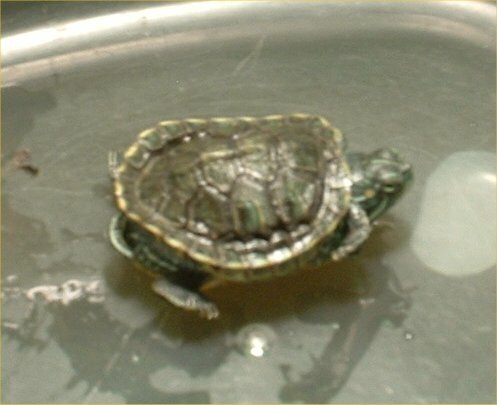 Baby turtle - top view in its setup (not an appropriate setup long term). 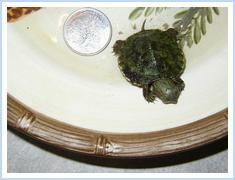 Stacey sent these photos of a hatchling red-eared slider named Toby on 5/11/07. 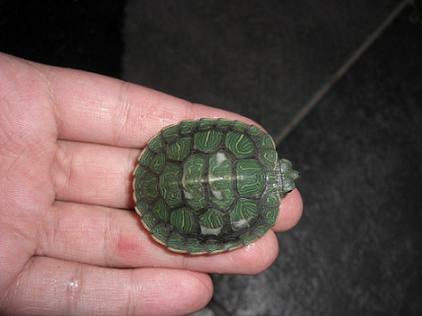 Baby red-eared slider - view from the front. 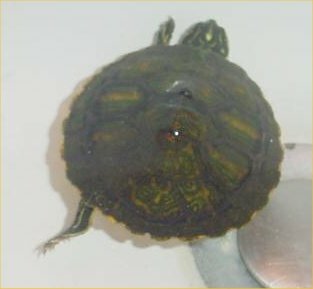 Baby red-eared slider - view from the front right side. 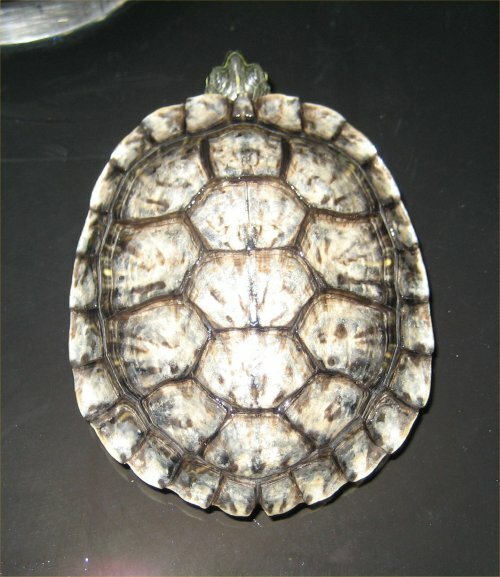 Baby red-eared slider - view from the back right side. 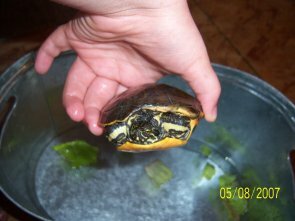 Diane sent these photos of a 1.5 inch yellow-bellied slider hatchling on 4/11/07. 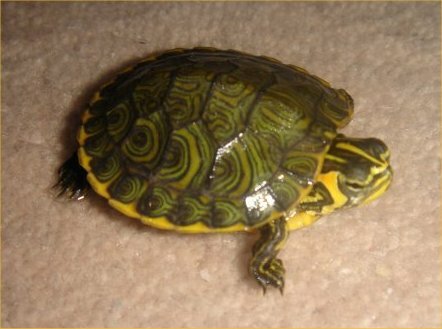 Yellow-bellied slider hatchling - side view. 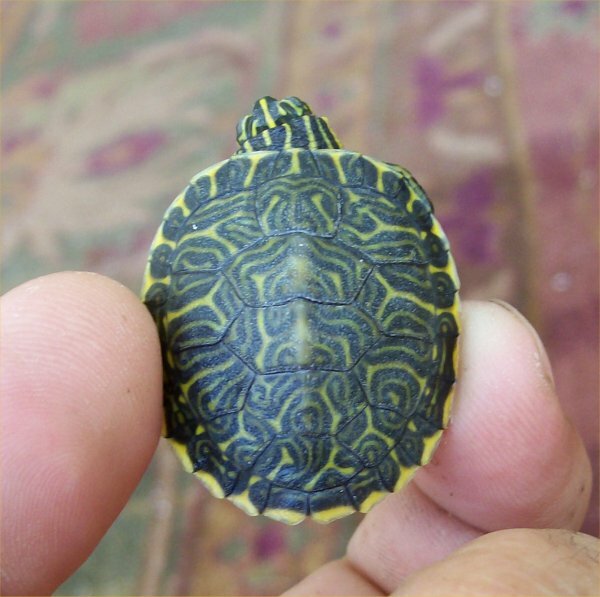 Yellow-bellied slider hatchling - top view. 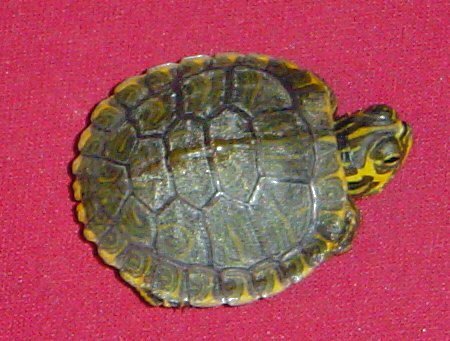 Yellow-bellied slider hatchling - bottom view. 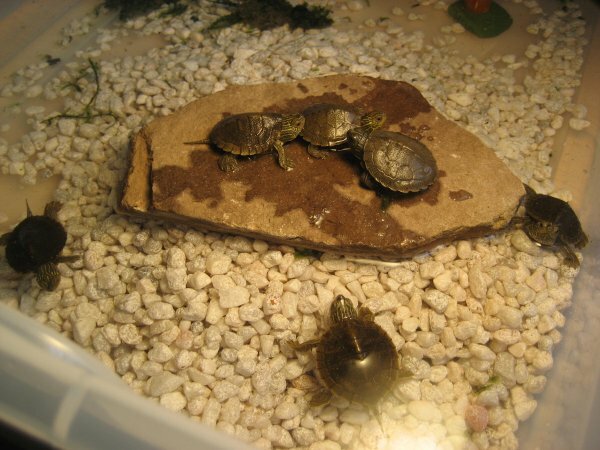 Sarah sent these photos of two baby turtles on 3/27/07. 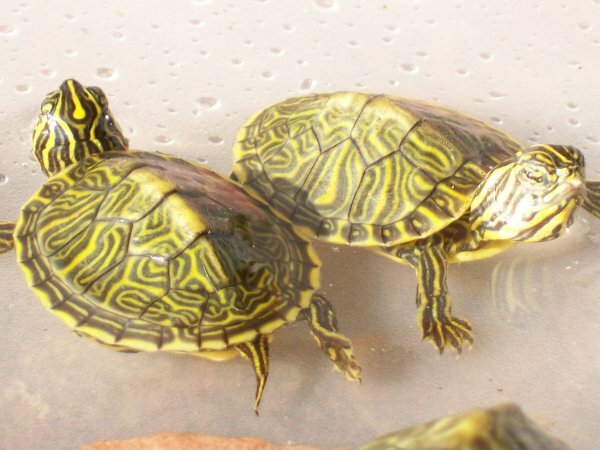 I think they are yellow-bellied sliders. 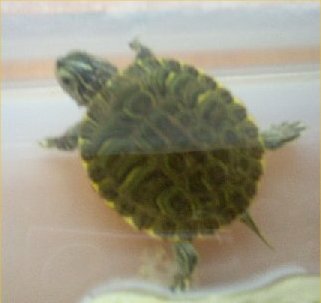 Jamie sent this photo of a baby turtle on 3/27/07. 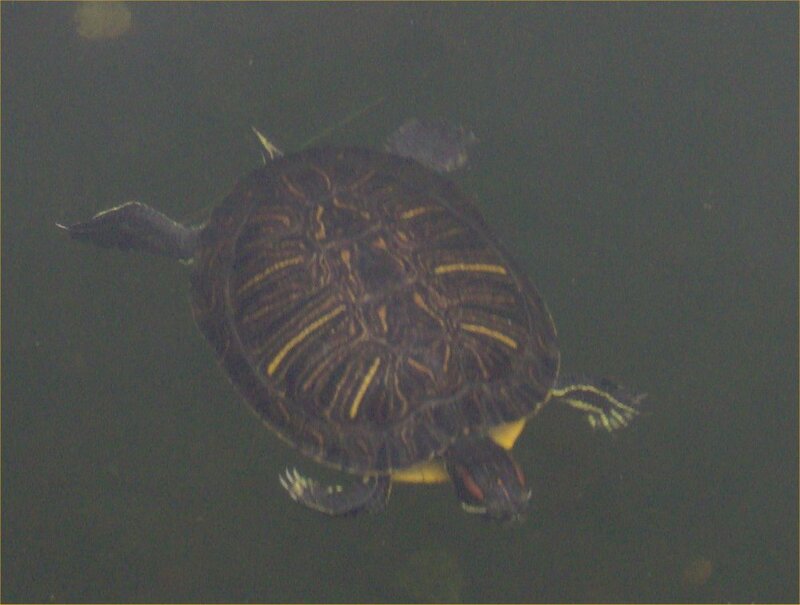 It was not a great picture so I could only guess that it might be a yellow-bellied slider. What do you think? 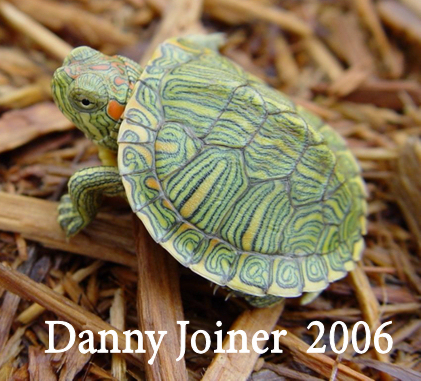 Dan sent these photos of cute hatchling turtles on 3/17/07 to ask if they were yellow-bellied sliders or chicken turtles. 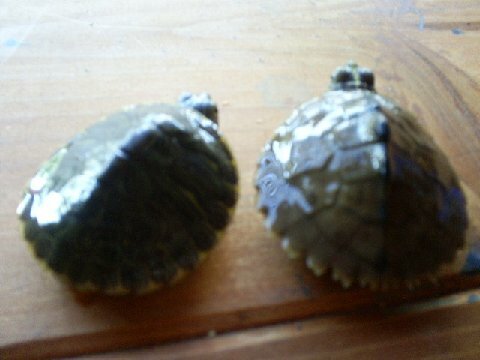 They look so similar to me that I am not positive but I think they are yellow-bellied sliders. 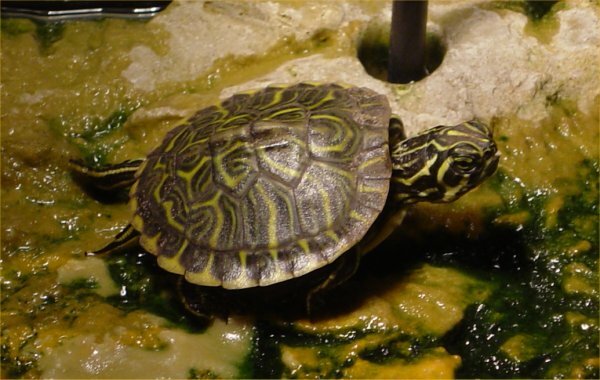 Jason sent these photos on 2/4/07 of his young red-eared slider that had a deformed shell. 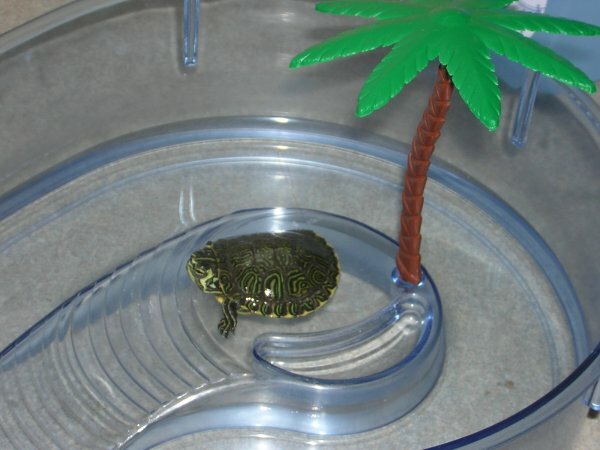 We discussed ways to improve Cursor the turtle's environment, light, and feeding so hopefully he got better. 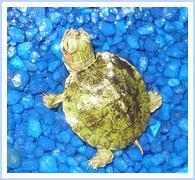 He had had the turtle for four months at the time of the photos. 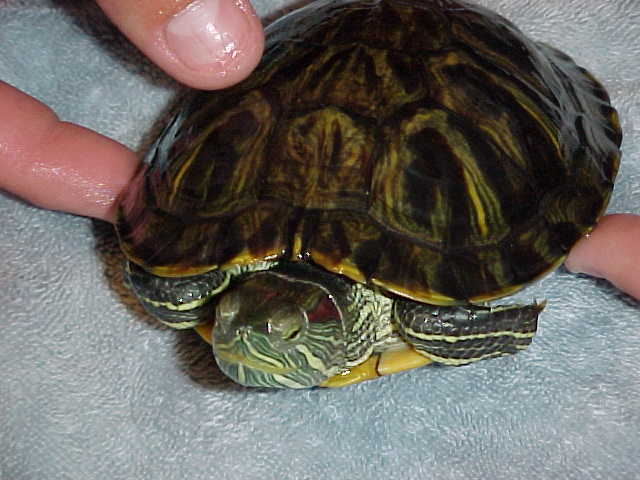 Danny sent me this great photo of a baby pastel red-eared slider on 10/18/06. 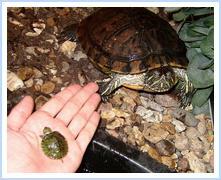 Randy sent a bunch of photos of his baby yellow-bellied slider on 9/25/06 that you can see on Randy's turtles page. 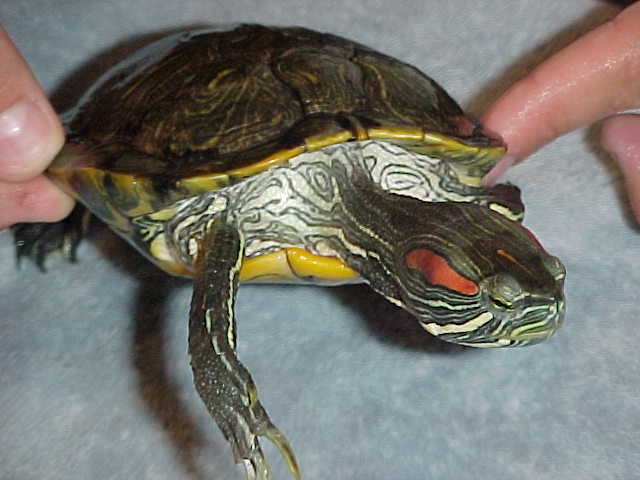 He later sent on 11/3/06, a bunch of photos of some red-eared sliders as well that I put on that page. 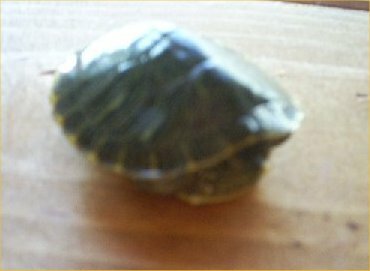 On 11/19/05 and 11/20/05 , Sarah sent me these photos after she found a baby red-eared slider hatchling in her RES's sand box. The baby is Lazarus. He did not survive and died on 11/28/05. 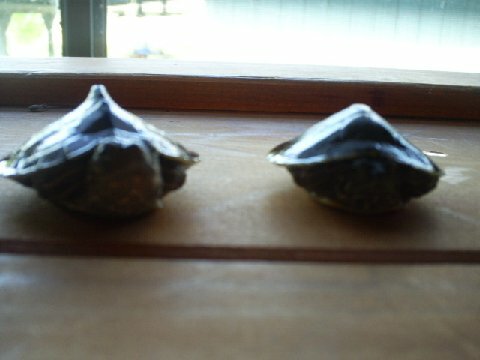 The parents are Honu (female) and Sweetie (male). 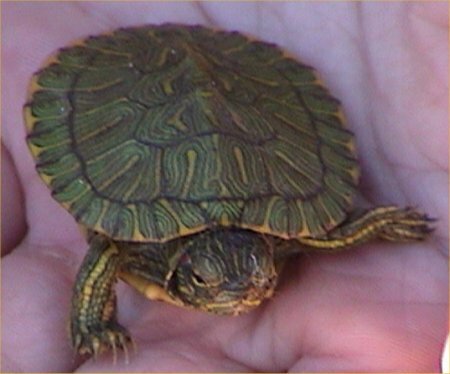 To see 3 photos of a yellow-bellied slider hatchling, go to my baby turtle photo page. 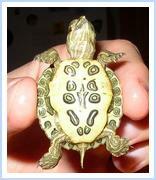 To see 2 photos of hatchling red-eared sliders, go to my baby turtle photo page. 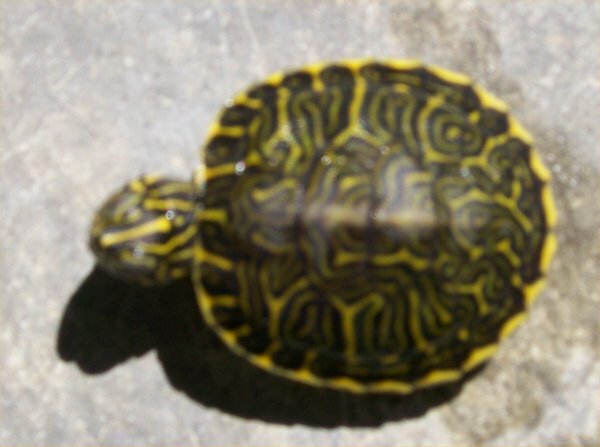 To see 3 photos of what could be a baby yellow-bellied slider, go to my baby turtle photo page. 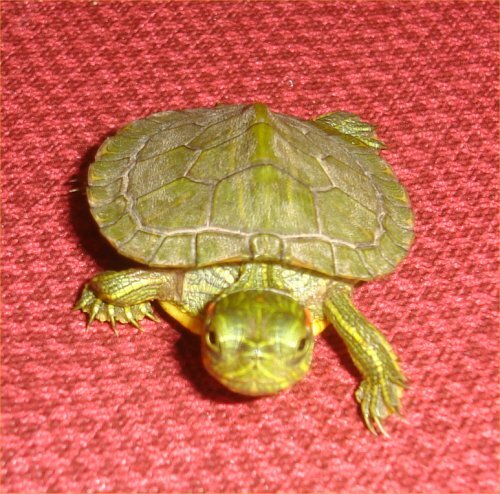 To see 7 photos of baby red-eared sliders and a yellow-eared slider that were sent to me, go to my baby turtle photo page. 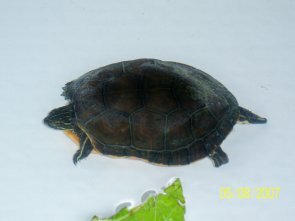 Here are two photos sent to my in early 2004 of a female RES and a male RES. 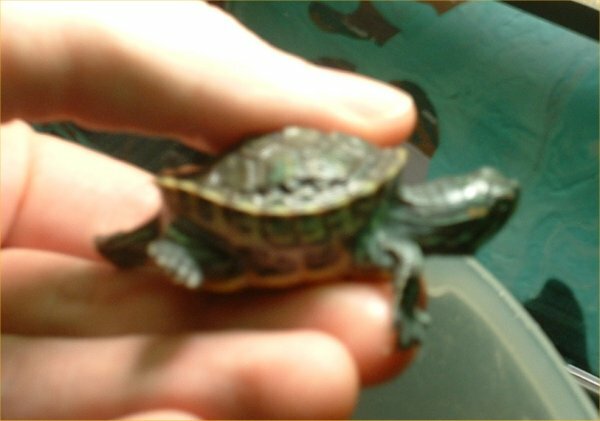 On 3/12/05, Renee sent me some photos of a baby turtle for identification. 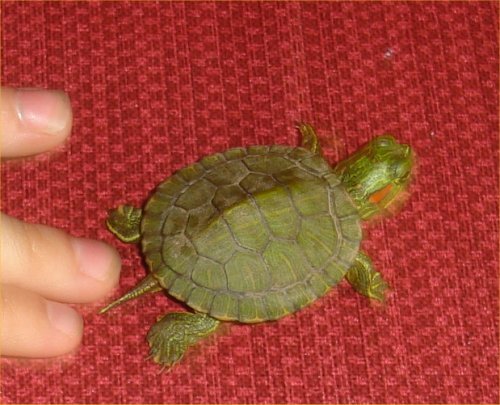 It is a baby red-eared slider. 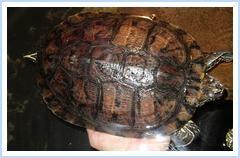 Here is a front view and a top/side view which shows the tell-tale red cheek stripe. 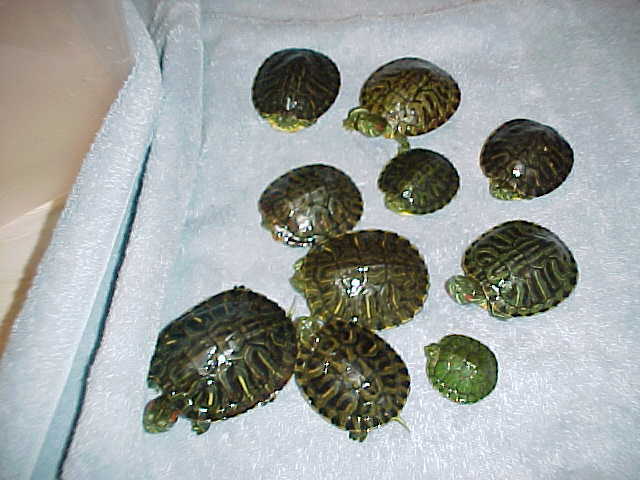 On 6/23/05, Chuck sent me these photos of some of his 16 turtles (all are red-eared sliders except for one yellow-bellied slider. 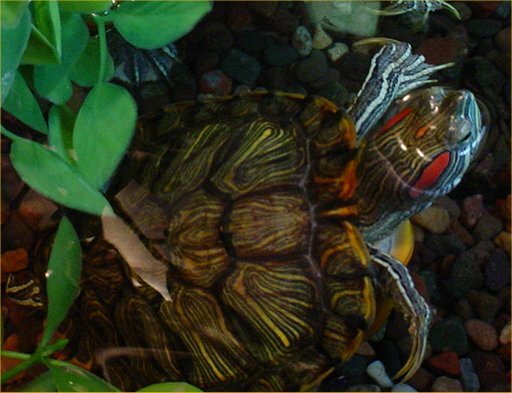 Red-Eared Sliders - a multilingual red-eared slider site. 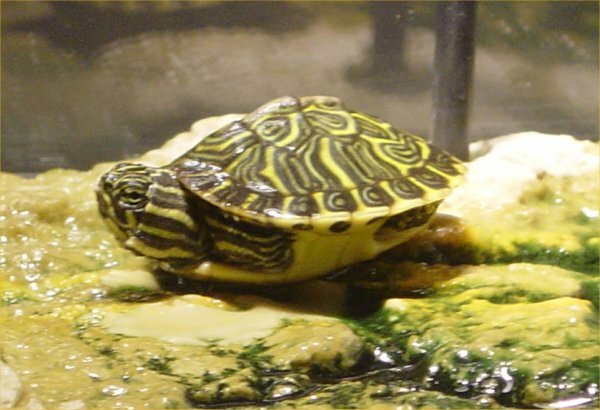 Slider Home - site on red-eared sliders. 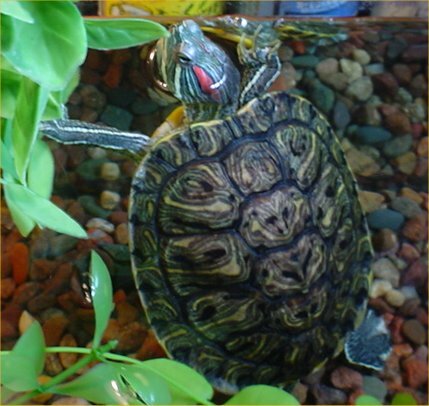 Red-Eared Sliders - the story of one owner of a pair of turtles and their baby, kept in an outdoor pond. 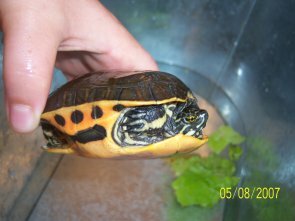 Red-Eared Sliders - history and care. 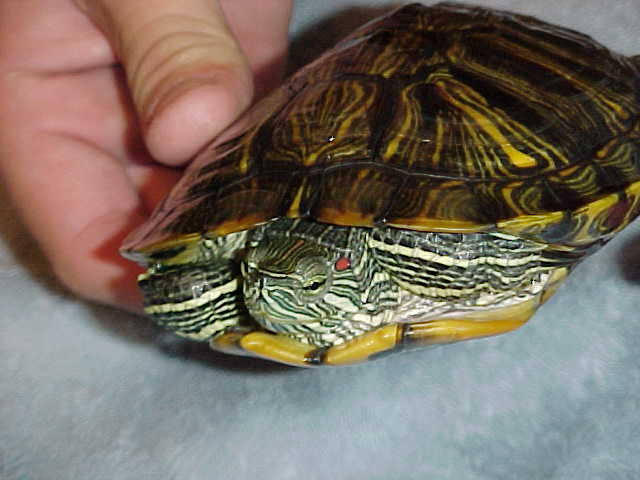 If you put "red-eared slider" into a search engine, you will get tens of thousands of hits. If you know of a good site, let me know so that I can add it here. Thanks.